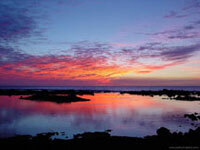 Located on the Southeastern coast of the island of Hawai‘i, the Wai‘ōpae Tidepools MLCD is about a one hour drive south of the Hilo airport. Take highway 130 heading south, then go east on highway 132 to highway 137. Travel about 1.1 miles south on highway 137 and turn east on Kapoho Kai Street. Follow road to parking areas marked by signs. The MLCD is located adjacent to a private subdivision called Vacationland. Follow directions on all signs posted; enter tidepools only at the designated shoreline access and respect private property. The MLCD extends from the highwater mark at the shoreline, with the northern boundary next to the first two-story house on the beach north of the parking area, and extends south about 700 meters. Signs mark the boundaries. The physical characteristics of Wai‘ōpae Tidepools are similar to a barrier reef. A shallow basalt ridge on the seaward side of the tide pools causes waves to break. However, the pools still get excellent water circulation by northeast tradewind-generated swells that help support abundant coral and fish life. There is rich coral growth in the tidepools with high diversity. Also, the tidepools support an unusually high abundance of juvenile fishes, which makes the area an important nursery for fishes. The tidepools are easily accessible and can be entered under most weather conditions except major storms. The nearshore bottom is pahoehoe lava with coral growth increasing as you swim farther out. Snorkelers will find excellent viewing in the inner and middle tidepools, with visibility decreasing seaward into the surf. The MLCD’s maximum depth is about 4 meters and is not recommended for SCUBA. Kayaking is discouraged to avoid breaking coral in shallow water. High surf and strong currents may occur during stormy weather conditions. Strong currents may also exist in some locations during periods of rapid tidal change. None. The closest public facility, including phones, is Ahalanui Beach Park, about 1.5 miles south. With a permit, to engage in activities otherwise prohibited by law for scientific, propagation, or other purposes. To fish for, take, or injure any marine life (including eggs), or possess in the water any device that may be used for the taking of marine life. To take or alter any sand, coral, or other geological feature or specimen, or possess in the water any device that may be used for that purpose. To anchor or moor any vessel. To conduct commercial activities, including but not limited to commercial tours, dive groups, sightseeing tours, hikes, or guided services.